In our previous blog “Revolution of Testing”, we have discussed the importance of test automation in today’s application development lifecycle. In this blog, we will discuss the major benefits of test automation in detail and how it can be taken to the next level. We all understand that testing is crucial to the success of a software product. If a software doesn’t work properly, the probability is very high that most people won’t buy or use it. However, testing to find defects or bugs is time-consuming, expensive, often repetitive, and subject to human error. Automated testing helps teams test faster; allows them to test substantially more lines of code, improves test accuracy, and frees up QA engineers so that they can focus on developing test strategies that require manual intervention and human skills. Test automation scripts themselves make a testing software. With every new test and every new bug discovery, a testing software gets upgraded and up-to-date. Though Test Automation tools face the criticism of being expensive their reusability and upgradability somewhat justify the cost. Automation is primarily used for regression testing. It drastically reduces the margin of error in the testing scenario by going through pre-recorded instructions. These automated regression tests help organizations to ensure whether all the pre-existing functionalities are stable in the new version. This is very critical, especially when some new developments take place in the existing software. Thus, automation ensures consistency and reliability of the developed software. Test automation is not an ad-hoc process and all the prepared tests for a software cannot be 100% automated. There should be a well-thought strategy behind what to be automated. Following are some of the guidelines for identifying tests that can be automated. So far, we discussed why, when, and what of test automation. The next step is to select an automation tool where automation scripts need to be written and executed. Today, there are popular COTS tools like QTP and open source tools like Selenium for test automation. These tools are standalone and are not connected with other phases of application development. Testers operate them in silos and publish the reports separately. Such isolated operations by team members reduce the efficiency of automation due to its dependency on manual interaction for execution of scripts and report collection. Currently, Kovair has the support for automation testing through integration with two of the most popular tools in test automation domain – QTP and Selenium. QTP-Kovair Integration – How often do we have to face the problem of scheduling QTP scripts, generating run results and reporting the results for test evaluation? Imagine, if you could manage all your automated test scripts from a single repository! Kovair-QTP Addon provides an opportunity of storing and viewing an automated test, executing a test, viewing the results from the executed test scripts, and executing multiple test scripts simultaneously in remote hosts from a single place. Kovair Integrated Test Management also enables users to check the run results of several iterations for a single test script. You can add your tests to Kovair iTM, schedule them to run in different hosts and use Kovair’s reporting engine to generate the Run Report. Selenium-Kovair Integration – Unlike QTP, Selenium does not have any dedicated tool for script storage or report generation. Hence, managing or scheduling the scripts becomes a very cumbersome process. What if there exists a tool that manages all of your automated Selenium scripts, schedules tests to run simultaneously on remote machines, and generates Run Reports? Kovair’s Selenium adapter/connector and Netbeans addon together enable you to add tests to Kovair, schedule them, run them in different host machines, and get the results delivered at your fingertips! Users can also schedule their scripts to run on a daily basis at the desired time on the desired host. With Kovair iTM, you can write test scripts from a single machine using an IDE and execute them wherever you want without any IDE installed in that remote host. The importance of test automation and its best practices have been embraced by many organizations. The benefits of automation such as efficient testing, reusability, upgradability, as described in this blog cannot be fully reaped until the organizations are able to see the end-to-end coverage of the entire project and its status. Kovair provides the ability to view an end-to-end coverage of the test automation benefits through its reports and traceability offerings so that you can ensure bug-free delivery to your customers. In our upcoming blog of this series, we will learn the importance of reports and traceability in the field of testing and test automation. 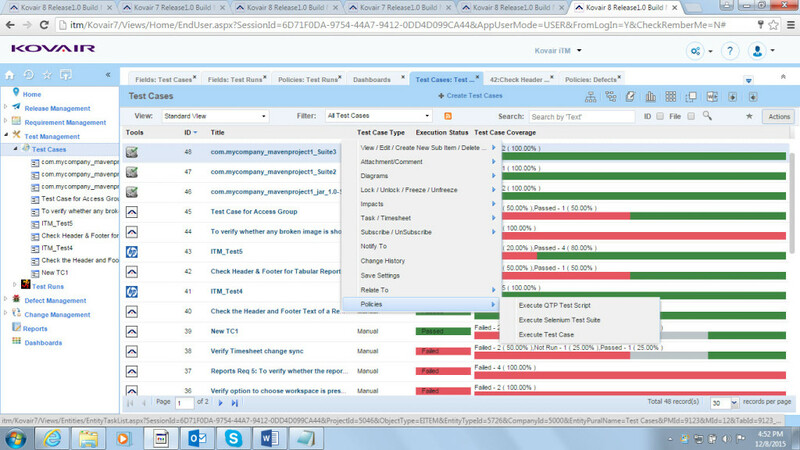 This article does a great job by telling us the Importance of Test Automation. The whole concept was explained very clearly. The article was very informative. Thanks for sharing such an informative article with us. A lot of studies has gone into this and I wish the author All The Best and Big Thanks to sharing your work.